Preheat oven to 300F. Line a 8 inch round cake pan with parchment paper. Prepare a bain marie using a large roasting pan so that the cake pan can sit comfortably inside with hot water coming half way up the pan. Melt butter, chocolate, and sugar over a pan of simmering water until smooth and homogeneous. In a separate bowl, stir together eggs, zest, and Grand Marnier. Slowly mix the egg into the chocolate and avoid beating too much air into the mixture. Gently fold in flour until it's incorporated. Pour batter into the cake pan and put the pan in the water bath. Bake the cake in the oven inside the water bath for 45 minutes until the surface is set. If you insert a knife in the centre, it should come out with streaky but not wet. Remove the cake pan from the water pan and cool to room temperature. Chill in the refrigerator until stiff enough to unmould. To prepare the glaze, bring cream to a boil and pour over the chocolate. If the heat of the cream is not enough to melt the chocolate, heat the ganache over a pot of simmering water until it is smooth and glossy. Remove from heat and stir in Grand Marnier. Let the ganache cool to tepid. Unmould cake onto cake board with the bottom facing up (because that's the smooth side). Set the cake over a cooling rack on top of a shallow baking sheet. Pour the glaze over the cake, making sure the whole cake is covered. Tap the cooling rack against the baking sheet to shake off excess glaze. Chill the cake in the refrigerator to set the glaze. To make the fingers, shape the marzipan into five logs of vary length and score lines with a knife to make knuckles. If the marzipan is too sticky to work with, dust some icing sugar on your palm. Press a sliced almond to one end to make the finger tip and adhere with some left over chocolate glaze. 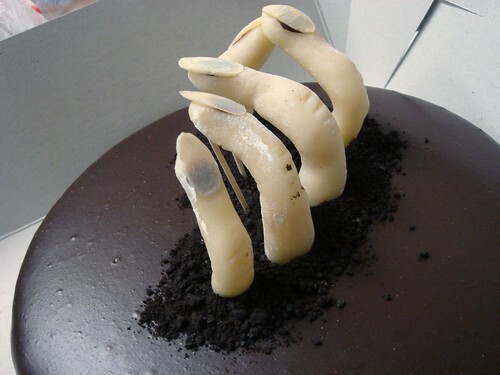 Adhere the finger to the cake with more left over chocolate glaze and prop them up with toothpicks if necessary. Sprinkle some chocolate cookie crumbs around the fingers to make dirt.